Tip: click on any image below to view it full-size. 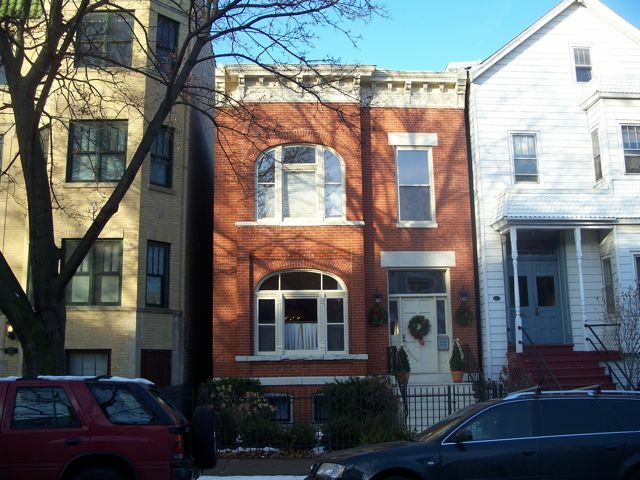 This 1890 Lincoln Park home illustrates how it is possible to weatherize victorian buildings without destroying their architecture. A previous contractor had tried to get aluminum triple track storms with square tops to fit into the arched openings. Sorry, no “before” pictures available, but the front of this building was not a pretty sight. 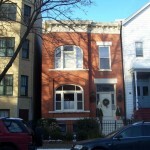 Besides an unsightly appearance, the owner was freezing in the front rooms, and looked to us for a solution. As is typical, she did not want storms that needed to be put up and taken down each year. We applied a number of techniques. The two double-hung windows on the first floor flanking the main window were fitted with wood storms that have an integrated screen, and a sliding glass panel on the inside that is simply opened for Summer and closed in Winter. 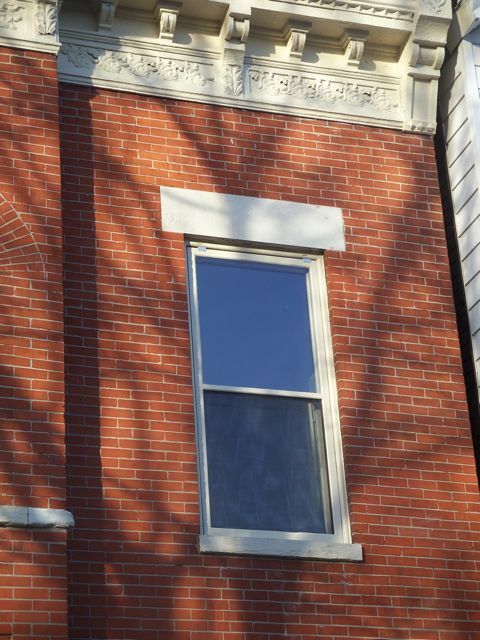 For the corresponding windows on the second floor, we built arched-top storms. Because the arch would limit travel of a sliding panel, these were designed with a removable panel in the lower half, which is easily swapped for a screen panel in Summer. The large window above the front door is also fitted with a screen in the lower half, and an integrated sliding panel which can be closed in Winter. The storms on the second floor were all installed by one person from the inside, without the use of a ladder. 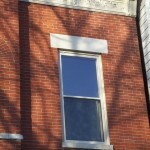 They can be removed the same way if maintenance is ever necessary, in spite of the fact that the window above the front door is larger than a typical door. These storms all feature low-e glass, and were built from reclaimed, old-growth wood in our shop in Chicago. Not shown are aluminum low-e storms used on the side of the building. 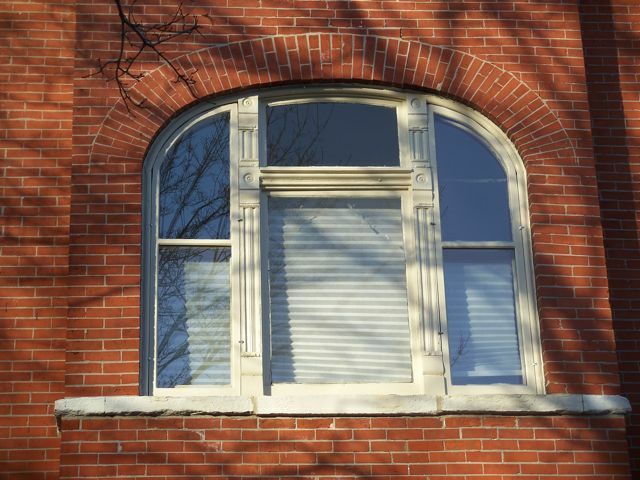 Weatherstripping is part of the wood storms, closing any gaps between the storm window where it fits the building. 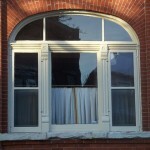 The primary windows were also repaired and weatherstripped as part of this project. 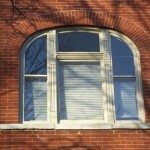 These arched-top storm windows have a changeable screen/storm panel on the lower half. 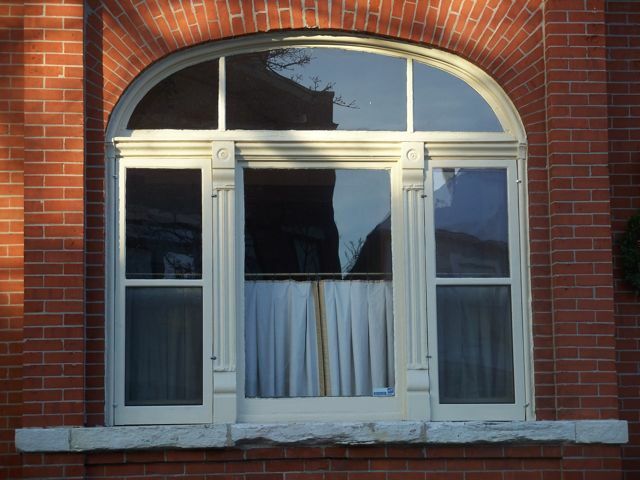 These two wood storm windows have an integrated screen/ with a sliding, self-storing storm panel hidden on the inside. This large wood storm window also features an integrated screen and sliding storm panel, so it does not need to be put up and down each year.